There’s a lot of talk nowadays of the underperformance of hedge fund managers, over the last two weeks we have had non-stop articles, blogs about how badly these guys are doing. They’re plenty of reasons one can come up to justify the underperformance of this group versus the SP500. There’s one reason that is never mentioned in the blog posts that bash the hedge fund industry. Too much money under management. As a group maybe they are not that talented. Main interest is collecting the 2% management fee than trying to swing for the fences to collect the 20% performance fee, in other words, they are afraid of career risk. We have way too many hedge funds and not enough stocks. Hedge funds are not long only products so comparing them to a long only 100% invested product is not a fair comparison, a 60/40 portfolio might be a better comparison. Fees are probably too high; the performance fee is a huge hurdle over the long term. Again, maybe as a group, they are not that talented. The one thing that rarely if ever makes it in the bashing of hedge funds blog posts is the fact that the SP500 has had one down year since 2005. Outperformance for most managers comes in the way of avoiding a market drawdown that lasts a few months to a year not just two weeks like the ones we have seen lately. 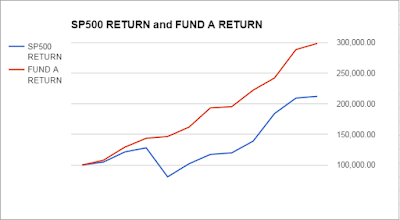 From the book Ivy Portfolio; from 1985 to June 2008 Harvard and Yale average an annualized return of 15.95% vs. an annualized return of 11.98% for the SP500. In those 24 years, U.S. stocks closed positive 20 out of 24 years. Harvard and Yale only managed to outperform U.S. stocks eight times during the 20 up years; they trailed the other 12-years. The difference in outperformance for the two endowments came during the down years; that was when all the other “stuff” paid off, whether that was cash, commodities, timber, puts, shorts, etc. 1988 U.S. stocks were down -6.98%, Harvard-Yale +2.75%. 2001 U.S. stocks down -14.83%, Harvard-Yale +3.25%. 2002 U.S stocks down -17.99%, Harvard-Yale +0.10%. As of June 30, 2008, U.S. stocks -13.12%, Harvard-Yale +6.55%. Below is the equity line chart of an actual hedge fund that started in 2005 vs. the SP500, a $100k dollar investment turned into $298,000 net of fees (2 and 25) versus $212.353 for the SP500. 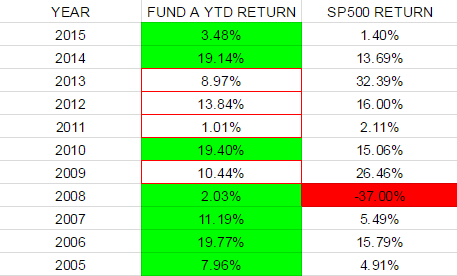 When you start analyzing the returns, you will realize that SP500 only had one down year since 2005, and the fund only outperforms the SP500 6 out of the ten positive years. 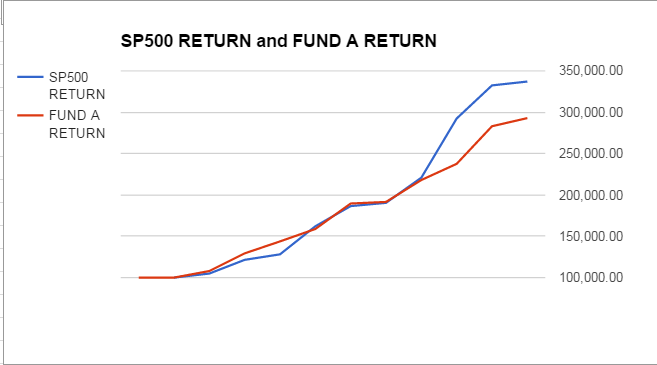 You can pretty much credit the cumulative outperformance of FUND A to 2008 when the SP500 was down -37% and they were up +2.03%, you take 2008 out, and the tables turn, and the SP500 has a better cumulative return; $293K for FUND A versus $337k for the SP500. I’m sure a lot of funds have this dilemma, hedge funds/active managers need down years.